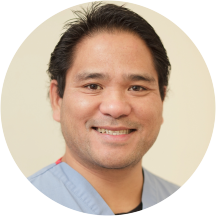 Joseph Tanlioco is a thorough and compassionate physical therapist serving patients in Bronx, Brooklyn, Valley Stream, and Richmond Hill, NY. Mr. Tanlioco believes in the importance of home exercise in conjunction with treatment programs for patients to achieve faster recovery. He offers a number of services, including electric stimulation, taping, soft tissue mobilization, gait training, and balance and postural re-education. He welcomes patients to his practice who are suffering from acute and chronic orthopedic and musculoskeletal conditions. Mr. Tanlioco treats patients as young as five years old. Mr. Tanlioco graduated from the University of the Ramon Magsaysay Memorial Medical Center. He has more than 15 years of experience in treating joint and musculoskeletal orthopedic conditions. When he is not working, Mr. Tanlioco enjoys giving back to the community by fundraising for his church and volunteering at various school programs on the weekends. I was very pleased. Everyone was quite helpful and the facility makes everything very convenient for their patients. No privacy and rooms are shared. Unattentive assistants. Staff and Physical therapist are have loud conversations and bounce a ball down the hall. Stay away from this place that's in a basement. Joseph Tanlioco, PT has no appointments on Zocdoc right now.